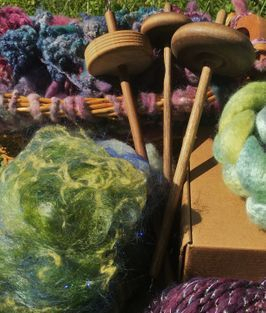 A monthly fiber sample box for a cause curated to send new hand spinners on fabulous adventures or to banish a creative rut for the experienced spinner. Each Sick Sheep Spin Bin will include at least 4 ounces of fiber. Every month a cause will be chosen to raise awareness of underdogs of society, diseases of all kinds, or any other undesirable thing needing assistance through this life. A nonprofit organization working for the selected cause will receive a donation from a portion of Sick Sheep Spin Bin sales. The first Sick Sheep Spin Bin will ship January 2019. A limited quantity are available for preorder. Reserve one today to start spinning for change. Starting in February 2019, you can purchase an individual Sick Sheep Spin Bin or a discounted monthly subscription.